Virginia State and Bowie State in, door closes on Skegee. The committee has spoken and the CIAA has two teams with a shot at winning the D2 national title, while no SIAC teams will make the field. CIAA champion Virginia State (10-0) will host West Georgia (8-3) in the opening round of the playoffs. VSU was given the second seed overall and will host a playoff game for the second time in four seasons. 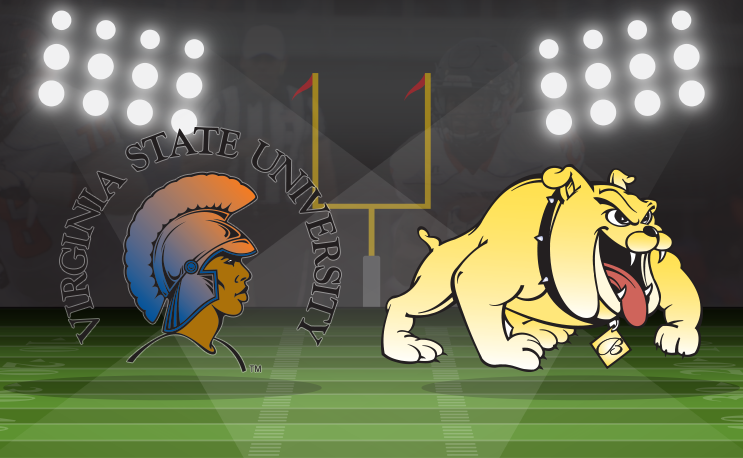 Bowie State, the runner-up in the CIAA’s Northern Division, will host (8-3) Delta State in the first round. BSU, the nation’s top offense, just missed out on its third-straight CIAA Northern Division title at 9-1 this season. Its lone loss came to VSU. Tuskgee, the SIAC champion, will miss the playoffs for the first time since 2012. ‘Skegee finished 9-2 but suffered losses to Albany State and Findlay and will have to sit out the postseason. We’ll cover the HBCUs in greater detail, but here is more about the PWIs in their Super Region. Wingate is back into the playoffs for the first time since 2010 and had an unbeaten season in play until Saturday. The Bulldogs lost its first game of the year, losing to Tusculum 25-17. Wingate averaged 32.7 points per game this season while holding its opponents to 21.8. The strength of its offense is definitely the run game, averaging 220 yards per game on the ground as a team. Through the air, Wingate averaged 184 yards per game. Defensively teams fared better in passing against the Bulldogs than they did running the ball. Wingate allowed 242 yards passing per game and only 108 yards rushing. That can also be a sign of its opponent trailing on the scoreboard and having to pass to catch up. West Alabama finished the season at 9-2, capped off with a narrow win over North Greenville on Saturday. Its only losses on the season came at the hands of FCS member Samford, a 49-41 loss, and a tough 41-39 setback at Florida Tech. Florida Tech finished the season as a 5-6 ballclub. The Tigers like to air it out, throwing for over 3,100 yards this season and averaging 39.3 points per game. Quarterback Harry Satterwhite has completed 65 percent of his passes this year while throwing 22 touchdowns versus 7 interceptions. Of the 3,107 team passing yards this year, Satterwhite is responsible for 2,921 of them. Six players on the team have caught touchdown passes this year, all of them average double-digit yardage per game. The University of West Georgia is 8-3 this year and frankly, they made mincemeat out of the SIAC on three separate occasions this season. West Georgia defeated Fort Valley State 34-9, Miles College 45-7 and Albany State 48-16. The Wolves’ three losses this season all came in Gulf South Conference play. UWG dropped games against Delta State, West Alabama, and West Florida, all of which were in the top ten of last week’s Super Region Two poll. UWG’s defense holds opponents to 13 points per game while the offense puts up roughly 33 points every weekend. Its offensive attack is pretty balanced, trending slightly towards the pass. The Wolves average 240 passing yards per game and 197 yards rushing. Delta State is another Gulf South Conference team who only lost to other GSC members. The exception is that one of its three losses came to an unranked Valdosta State team. While Valdosta State has a legacy of football greatness, this was an off year for the Blazers, finishing just 5-4. Anything can happen between conference rivals, but if one were to split hairs the Valdosta loss could be your starting point. Delta State’s other two losses came against West Alabama and North Alabama. The Statesman on average play fairly close ballgames, outscoring its opponents 29.6 to 21 points per game. Running is its strong suit, with 214 yards per game on the ground compared to 170 yards passing per game. This is the team Tuskegee fans will be side-eyeing for a long time. The University of West Florida jumped four spots in the last poll to claim the spot that some thought Tuskegee would get. Its 34-29 win on Saturday versus West Georgia proved to be enough to sway the committee into a sixth seed. The Argonauts are 7-3 overall with losses to Valdosta State, Delta State and West Alabama. West Florida averages an even 29 points per game while allowing 23.2 points per game. UWF averages 237 yards per game passing and 113 yards per game rushing.